WHEREAS, Owner and Manager desire to enter into an agreement whereby Manager will manage the ____________ property upon the terms, covenants and conditions herein set forth. 2. TERM. The term of this Agreement shall be for month to month commencing on__________ (the “Commencement Date”) and continuing (a) until terminated by either party, without cause or penalty, upon not less than thirty (30) days prior written notice, with the effective date of termination to be on the last day of the first calendar month following the month in which said notice is received, or (b) until terminated under any other provision hereof. 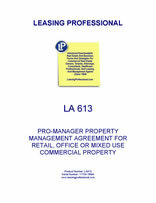 (a) Manage the operation of the Premises and render the usual and customary services incidental thereto, in a professional, businesslike and efficient manner, with discretion as to the specifics thereof as the Manager deems advisable, subject only to the limitations contained in this Agreement. Owner reserves the right to establish all rental rates to be charged tenants of the Premises (“Tenants”) and to determine the form of leases to be entered into with said Tenants (“Tenant Leases”). (b) Advertise the availability of units or premises, display “for lease” signs, cancel existing Tenant Leases and negotiate Tenant Leases with existing and prospective tenants, all upon term and conditions outlined by Owner. All Tenant Leases shall be on Owner’s standard lease form or on a lease form approved by Owner. Tenant Leases may be signed by Manager, provided Owner’s form of Tenant Lease and Owner’s rent schedule are used. (c) Bill and take all reasonably necessary action to collect all rents and other amounts due Owner under the Tenant Leases in accordance with the terms of the Tenant Leases. (d) Hire, pay, provide customary benefits for and supervise sufficient experienced and qualified personnel who will render the services required by this Agreement for the professional, businesslike and efficient operation of the Premises. Manager shall not provide any on-site employees. All persons employed to provide the services hereunder shall be employees of Manager and not of Owner, and shall have no authority to act as the agent of Owner. (e) Handle and promptly respond to all Tenant requests and negotiations. (f) Perform repairs and maintenance of a custodial nature and arrange and supervise routine improvements, alterations and repairs as may be required by Owner and good management standards. (g) With Owner’s prior written approval as to any contracts over $500.00, bid, negotiate and enter into, and supervise, all repair, maintenance service, material and utility contracts on behalf of Owner and the Premises. (h) Promptly notify Owner of any matter that in Manager’s reasonable judgment requires Owner’s attention. (i) Advise and cooperate with Owner in the development and implementation of rules and regulations applicable to the Premises, and enforce such applicable rules and regulations as Owner shall adopt. (j) Obtain and maintain the policies of insurance specified in Section 7(a) hereof. (k) Prepare and file all necessary returns, reports and forms required by law in connection with unemployment insurance, social security taxes, worker’s compensation insurance, disability benefits, Federal and state income tax withholding and other similar taxes and all other returns and reports required by any Federal, state or municipal authority (other than income and property tax returns of the Owner) and pay or make all deposits required for such taxes. (l) Annually during the term, Manager shall prepare and deliver to Owner a budget, for Owner’s reasonable approval, reflecting the Gross Receipts and Operating Expenses (defined below) which Manager expects to receive and incur, respectively, during Owner’s forthcoming fiscal year (the “Budget”), it being agreed that if Owner for any reason does not respond to any proposed Budget within thirty (30) days after Owner’s receipt thereof, said Budget shall be deemed approved. If at any time during the period covered by an approved Budget it appears to Manager that the actual total of all Operating Expenses likely to be incurred during said period will exceed the Budget’s projected total by more than ten percent (10%), Manager shall promptly so advise Owner, and Owner and Manager shall jointly discuss what actions, if any, could be taken to minimize the Operating Expenses without substantially impairing operations hereunder. The Owner shall pay Manager for expenses incurred by Manager in the performance of its duties, obligations and services pursuant to this Agreement (collectively, “Operating Expenses”). Operating Expenses shall include, without limitation, all costs, charges and administrative expenses for: to the extent applicable, salaries and wages and associated payroll burden (including, without limitation, payroll taxes and fringe benefits); license and permit fees; supplies, maintenance and repair to be performed by Manager; utility charges (except to the extent paid directly by Owner); bookkeeping and administrative services; health insurance and workers’ compensation. Owner shall procure the property insurance specified in Section 11 herein, but the cost shall be deemed an Operating Expense. In addition, certain Owner costs as designated in Section 9 herein below may be deemed Operating Expenses at Owner’s option. Such Operating Expenses shall be paid from the Premises Account (defined in Section 4 below). Operating Expenses shall not include (i) the costs of maintenance and repair required of Owner hereunder, or (ii) Owner’s various costs associated with its ownership and/or occupancy of the Premises, including without limitation depreciation, real estate taxes and assessments, taxes on Owner’s personal property, debt retirement (including without limitation mortgage interest), rent and such costs and expenses as may be necessitated to comply with the Americans With Disabilities Act of 1990). Payment of such expenses and costs are the sole obligation of Owner. “Reimbursable Costs” are any expenses which are not deemed Operating Expenses and are approved by Owner prior to expenditure. If Owner disputes any Operating Expense or Reimbursable Cost, Owner shall give Manager written notice specifying the item disputed and the reason therefor. Payment for any Operating Expense or Reimbursable Cost which is not disputed shall not be withheld. The parties shall, in good faith, diligently pursue resolution of any disputed item within thirty (30) days of said notice. 4. GROSS RECEIPTS; NET PROFIT. All Gross Receipts collected by Manager shall be deposited in an account in the State of ____________ (the “Premises Account”) established at a federally insured bank or trust company, and Manager shall be under no liability or responsibility for any loss resulting from the insolvency of any such depository. “Gross Receipts” shall mean (a) all cash collected by Manager from Tenants for amounts due under the Tenant Leases, whether rent, reimbursable charges, or other amounts, provided all said amounts are amounts that are due under the Tenant Leases, and (b) all cash collected from all other operations whatsoever at the Premises including, without limitation, and as applicable, laundry and vending machines and billboard and other advertising. “Net Profit” is the balance remaining after deducting all Operating Expenses and Reimbursable Costs from Gross Receipts. All Net Profit [less deductions for Manager’s Management Fee and the amount necessary to maintain the Working Capital Level (defined in Section 6 herein below) in the Premises Account] shall be paid to Owner concurrently with the delivery of the monthly statement required in Section 8 of this Agreement. 5. MANAGEMENT FEE. As compensation for Manager’s services hereunder, Owner shall pay Manager a management fee of $________ per month (the “Management Fee”), which fee may be deducted by Manager from the Premises Account. Provided this Agreement is still in effect, on __________ and on each anniversary of such date thereafter during the term of this Agreement, the Management Fee shall be increased annually by the greater of (a) ________ percent (___%) or (b) the annual percentage increase during such period in the U.S. Consumer Price Index for Urban Consumers –____________ area (“CPI”) (1982-84 = 100).